I have no further details but this was highlighted on the PLF group on Facebook. Those of you who read Greek may be able to provide more background. This entry was posted in Uncategorized and tagged Greece, Patrick Leigh Fermor on April 20, 2012 by proverbs6to10. Paddy died in uk Mairi Browne. As far as I can tell, the author never met Paddy. Manousos was born in Anogeia, Crete, and studied medicine in Salonika, with postgraduate studies in London, Oxford and New York. According to the publisher’s press release, after (or perhaps alongside?) a career devoted to gastroenterology, he turned to the writing of books “about Cretan history”. I have no idea whether the error concerning the place of Paddy’s death is limited to the press release, or whether it also appears in the book. Thank you, John. Well, quite inaccurate for a press release or the author, if so. This is how mythos are born. The book’s full title is Patrick Leigh Fermor: England’s Last Hero. 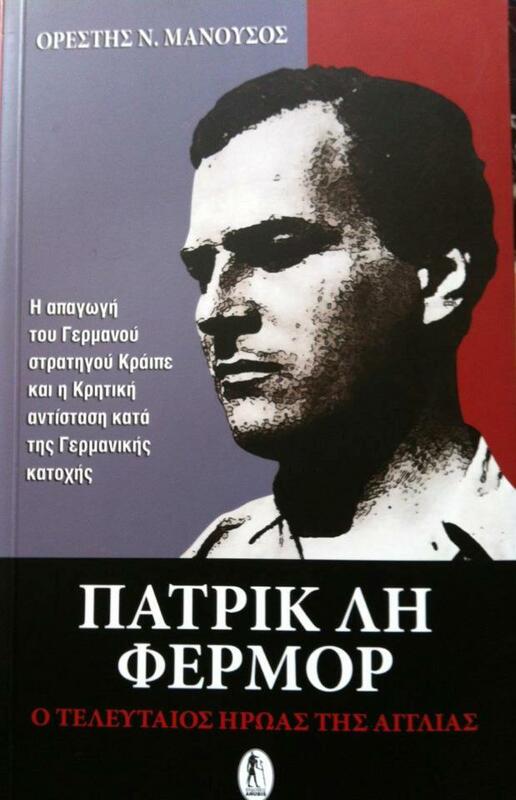 According to post on a Cretan internet site which reproduces the publisher’s press release, “this book is an homage to Fermor, who died on 10 June 2011 in Kardamyli”. It appears to cover (I haven’t yet seen a copy myself) all the major events in Paddy’s life, though the blurb on the book cover reads “The kidnapping of German General Kreipe and the Cretan resistance to German occupation”.